EA (Electronic Arts) along with ESPN announced Barry Sanders, former running back of the Detroit Lions — a legend and Hall of Famer won the right via a voting system to grace the new cover of Madden 25. 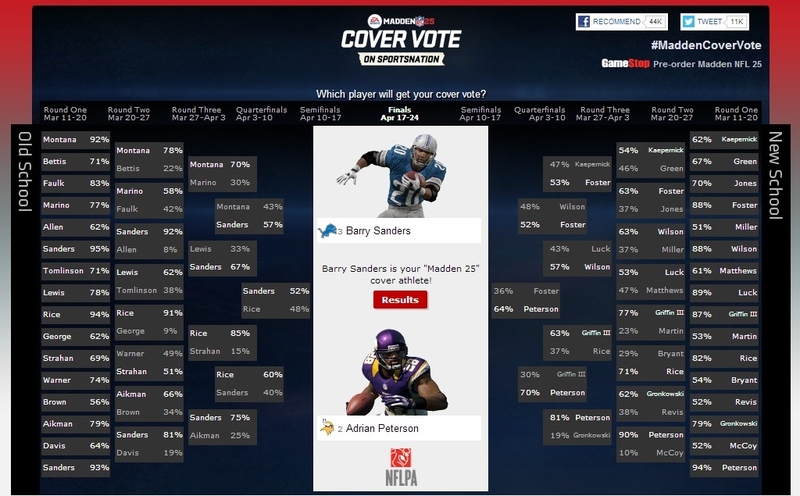 Sanders went through 6 rounds with the finalists coming down to Barry himself and Adrian Peterson, the spectacular running back for the Minnesota Vikings. This particular year highlighted the old school vs the new school, which pitted new school players against themselves in a bracket and old school players against themselves in a bracket which would lead to a finals showdown, it’s safe to say old school won. If your confused by the “25” (it should be “14” ) it’s because EA is celebrating 25 years of the franchises existence. In irony the game focuses on new run play mechanics being called “Run Free” which advertises the best controls for ball carriers ever seen before in a Madden game.